Rumours the White Light singer could be hanging up his mic were sparked when a picture of a red curtain was posted on his website, which was also stripped of all links. Some fans apparently took the image to mean George was closing the curtain on his pop career, but his spokesperson told NME that the speculation was unfounded. The representative said: "I do not understand where people are getting any of this from. "Our team that deal with the website and fan club were just being creative when they blackened out the website and added a curtain. This is only to give space and time to make some really exciting news for 2014." Visitors to the site now see the pair of curtains and a message promising "exciting news" next year. 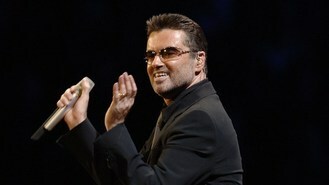 There was no word on what the singer's announcement might be, but the spokesperson said 2014 would be a "lovely year musically for George, and all of his fans". The Faith singer has been out of the spotlight since earlier this year when he had to be treated in hospital after falling out of a moving car on the motorway. However, the spokesperson said the 50-year-old was in "great shape".